This year the team will be in Toulumne county. We will have a simpler setup than in years past. Still MM, with 2 CW and 1 SSB station, but the SSB station will be a single R-9 vertical. We are also experimenting with a new 80m vertical. Our planned QTH is just east of Strawberry on FR 3N39. OK headed back to Tehama county for CQP again this year. This will be our last time there. Dropping back to a multi-single HP operation with just 3 ops. 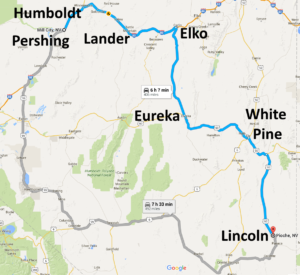 The rest of the team will be in Trinity, maybe Shasta and possibly Colusa. We are splitting team in order to get some counties on the air with a respectable number of Qs. We will be N6T in Tehama this year. Ops are N6RNO, N3RC and WB6HYD. KT-34 tri-bander and wires on 40/80 all from 50 ft tubular tower. K3 and associated equipment at 500w. We need about 200,00 points to beat the old 1998 MSHP record. So this blog is a little late considering the time covered. Monday after 7QP I head over to HRO to test out my IC-7100 and figure out what went wrong. Reset all the menu items to match the HRO 7100. Still no SSB modulation. Swap parts around. Whatever is wrong is in the base unit. Attach wattmeter and try AM. No modulation but carrier is present. So mike works, I can record audio but I cannot modulate the carrier. Just about to pack it in and send it to Icom when last try, full reset. Magic happens. Radio now works. Some non-configurable register is blocking the modulation. Worse, I knew about the full reset (I tried soft reset just above on Saturday) and did not try it. My own fault. Next time I know to do the full monty. Yeah next time for sure. My IC-7100 is showing no power out with SSB. This makes no sense. When I use AM, it’s enough to tune my Tarheel with the TargetTuner. But the power meter for SSB shows no output power. Really wish I had an actual power meter. And wait my laptop is on battery? But it’s plugged into the inverter! What gives. Only 7 more hours until the contest starts. Looks like I am DOA (dead on arrival). Out of the contest. Brought my K3 as backup but forgot the cable for the computer. Laptop has only 1 hour charge left. Hope the rest get on the air. This has been a very frustrating day. Thank you W6HMT for whipping me in Stillwater. Somewhere after Fernly NV, I lost my 6 foot whip for my Tarheel. Contest over, cancel the reservations. Finis and I did not even get to start. Vivian and I decided to look at some property in Fallon. Afterwards, we headed to Stillwater the former county seat for Churchill county. While reading the historical marker a truck with lots of quills rolled by and stopped just ahead. We pull forward and got out and chatted. Turns out it was a fellow ham from California who just happens to own a small piece of land in Stillwater. As luck would have it, W6HMT just happens to have a spare 5 ft whip he could sell me. Checked it out and it tunes on 75m. Back in business. Later, we roll by W6GJB as he was scouting on 50 near Erueka. He was headed to Antelope Pass for a final check on their White Pine site. 73… time to check that radio and computer are ready for 6 am tomorrow. So over night the storm we raced ahead of, caught us in Ely. About midnight heavy sleet pelted our hotel. By 6 am wet snow was falling. Snow continued until about 9 am. 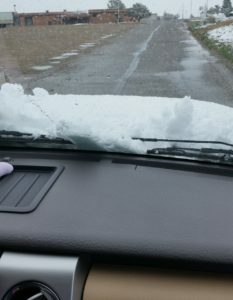 My truck was covered in snow. We hit the road about 8:30 back 50 to Eureka and then up 278 to Carlin. Not sure why I thought i would be able to operate on the 278 Eureka/Elko border. That was a canyon with limited North/South opening and several hundred foot up on the east just a couple of hundred feet away and no shoulder. Takeoff was probably 60°… not good. Eureka/Elko line on 80 is just viable. The Lander/Humboldt line is good right at the sign. Over in Pershing the rest stop at the 158 exit is the best bet. So general plan for May 7 is confirmed. Longest drive is the one to Carlin at about 4 hours. The rest are about 1 hour each. Now for the great news. I got a volunteer driver: KI6HFS (Vivian my YL). So even during the drives I’ll be able to get a few more Q’s in the log. Might even get her to operate for the 3db bonus. So yesterday Vivian and I left home and stayed in Carson City. Why? To get ahead of the storm that was supposed to hit Tahoe. Today, we drive across Nevada with winds blowing in excess of 20 mph. What a trip. I pulled down my Tarheel 100-HP at the start as the winds were making it move too much while I was only driving 35 mph. Five miles out from Fallon we hear a thud and a metal on metal sound. Thought we were side swiped by one of the many tumble weeds we had been seeing. Wrong… well maybe not but we did not see the culprit. A couple minutes later we get a tire pressure warning. So we quickly check Google and find out there is a Les Schwab in Fallon. Great possible free repair if we make it that far. Lucky us, get there and the tire is squealing and a whistling and we can actually see the puncture between the treads. 30 minutes later we are back on the road. Just past Eureka (65 miles from Ely) I notice that my Larsen 144/440 antenna is bent over and not looking good. I pull over to discover that this version has a saftey feature to bend over. I pop it back and pull it off the truck. Only my 220 antenna is now active and I have no repeaters programmed on 220. Oh well. We did get to scout the Lincoln/White Pine site. It is very accessible on 93. Only issue is that there will probably be no propagation to the west . Those mountains are too close and tall. It is 53 miles south of Ely on 93. About an hour drive. Off to bed to scout more tomorrow. Maybe tomorrow the winds will die down and I can put all the antennae back up. My exact schedule is still to be worked out. I need to scout the county lines. My final stop for the contest will be in Pershing. I will be operating mostly SSB but there may be a little CW. I will most likely not operate RTTY although I have all the software and hardware installed to operated RTTY as well. Just too much to do and so little time. I do not have an exact operations plan. I will be posting that as I work out the specific details. Bands will be 15, 20, 40 and 80 as conditions dictate. OK, converting from previous MediaWiki into WordPress. This will allow for a blogish approach. The old MediaWiki site will be completely revamped over the coming months. In fact it has actually been dead due to updates to the various components and databases and I have not properly transitioned older data.